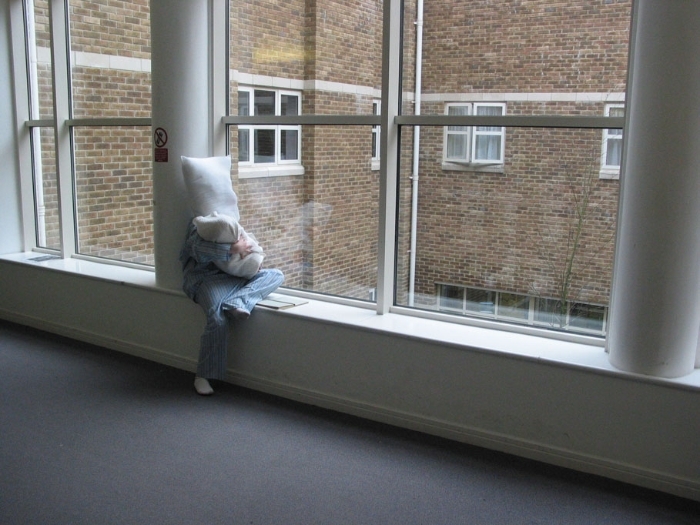 In 2004 Visiting Time opened in the East Wing of Dorset County Hospital, with audiences of five at a time invited to an ‘appointment’ for ‘treatment’. 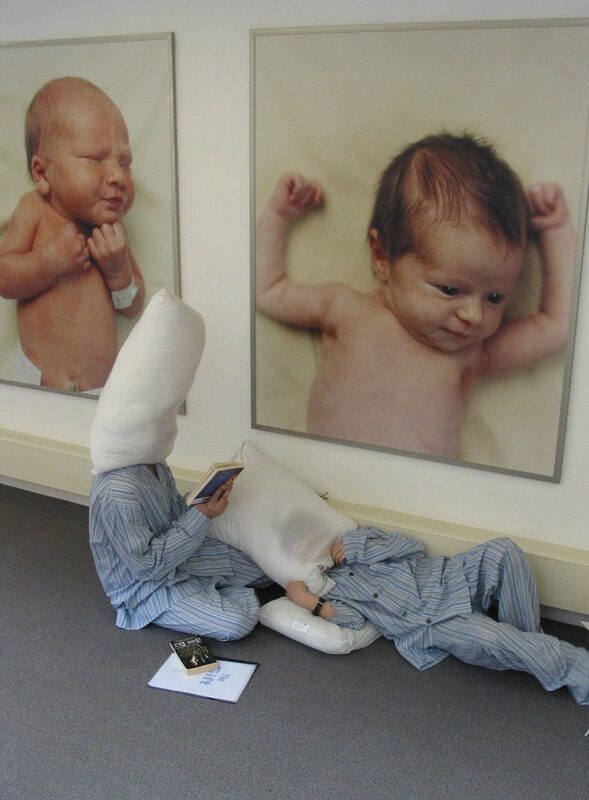 They were tagged and swabbed, and led by performers, all clad in pyjamas and pillow-head masks, through a working hospital, encountering along the way a series of performance installations. In one a ‘pillow-head’ figure, limbless, trapped in a cotton-wool cocoon, attempted to keep a balloon in the air (see image, right). In the lecture theatre a scientist asked the audience the enigmatic question: “How can I make a snowball when my hands are always hot?”, referring to a condition associated with cystic fibrosis. Visiting Time came out of a collaboration between West Dorset General Hospitals NHS Trust and the Sir John Colfox School, Bridport. The piece was devised with help from a young patient with cystic fibrosis, hospital staff, nurses and a geneticist. 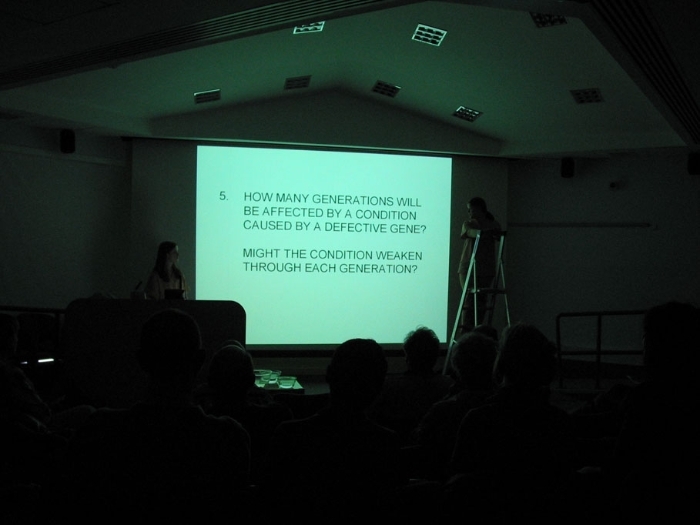 Its substantive thematic content was to investigate the science and human impact of genetic inheritance, but aesthetically the task was about the possibilities of making performance in spaces not dedicated to performance ends, in this case a working hospital. Visiting Time was inspired by ‘A small Bit of Time’ the story of Gareth, a teenager with Cystic Fibrosis, part of the Wall of Words project at Dorset County Hospital. Visiting Time & Boychild Site specific pedagogical experiments on the boundaries of theatre and science A. Ledgard in Parry, S. Nicholson ,H., Levinson, R. (eds.) Creative Encounters, Wellcome Trust, London.